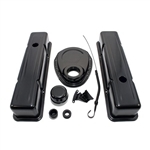 New bolt-in design heater delete plate for your Chevelle. Exact fit for all 64, 65, 66, 67, 68, 69, 70, 71, and 72 models without factory installed air conditioning. An easy way to smooth your factory firewall, just bolt into place. Also can work when installing an aftermarket air conditioning system like Vintage Air. This coverer comes with a smooth black EDP coating. 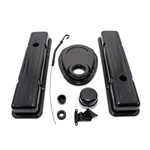 This part works for both 1964-1972 Chevelle clutch pedal and brake pedal trim for cars with manual transmission. Brand new Chevelle / Nova upper ball joint Rivet Bolt Set. Mounts the upper ball joints to the upper control a-arm and gives it the appearance of a real rivet. These also have a serrated locking rivet head so it doesn’t spin when you tighten the nut. Comes with eight Grade 8 rivet bolts, eight lock washers and eight nuts. Trying to rivet your upper ball joints on can be a very difficult job. Using this new kit will save you a lot of time and energy while getting the look you want. Keep your Camaro looking original with this kit, order yours today. Correct NEW center kick down swivel linkage bellcrank bracket for 1964 - 1972 Power Glide Transmissions. Mounts on the side of your trans bellhousing. Exact fit for all power glide transmission equipped cars. 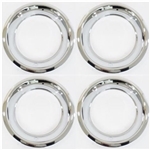 Machined from solid 304 stainless steel to be used for direct replacement of the factory units. Show car ready and made in the USA! New bump stop rubber provided. Correct for all 64 - 72 Chevelle & 68 - 72 Nova models. Sold as a pair only. Please choose finish. New protective rubber cover for your firewall circuit breaker relays. If your have power options like; convertible top, power seats, cruise control, power windows, etc, you will have a circuit breaker / relay on your firewall. GM designed this handy rubber cover to protect those relays. Correct shape, size, and fit. Replace your damaged or missing unit today. Correct front wheel bearing grease dust cap with the original raised stamped button in the center f the cap for 64 - 72 models. Replaces original GM # 3775190 & 539153. Sold each. New SB fuel pump for your Chevelle or Nova. Mechanical fuel pump made from heavy duty construction for continuous high RPM operation. Fuel body casting can be rotated to accommodate various plumbing situations. Fuel pressure regulator is not required. New correct design fuel pump for your Chevelle or Nova. Exact raised large AC logo on both sides. Factory shape, size, details and fits as original. 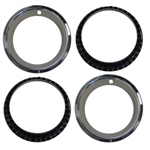 Replaces original GM part numbers; 6416739 , 6416740 , and 6470424 perfectly. 3/8 diameter fuel hose inlet and this pump does not have a provision for the vent vapor return line. Includes engine block sealing gasket. Correct for all big block engine sizes. This pump cross references to 40727 and 40470. Order yours today!! *Also fits most all high performance 1967 1968 1969 1970 1971 1972 Impala / Truck / Chevelle / Camaro / Nova with 396 / 402 / 454 / LS5 / LS6 / L78 / L89 engines. This pump has the smaller or short reservoir tank with a 3/8 fuel line and no provision for a vent vapor return line.